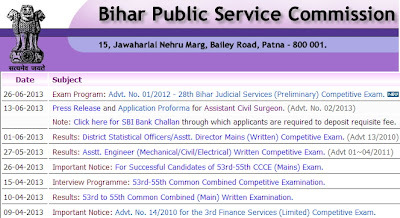 bpsc.bih.nic.in is the official website of Bihar Public Service Commission (BPSC) Recruitment 2013 Online Applications where citizens of Bihar get Government Job Notifications and instructions to apply. 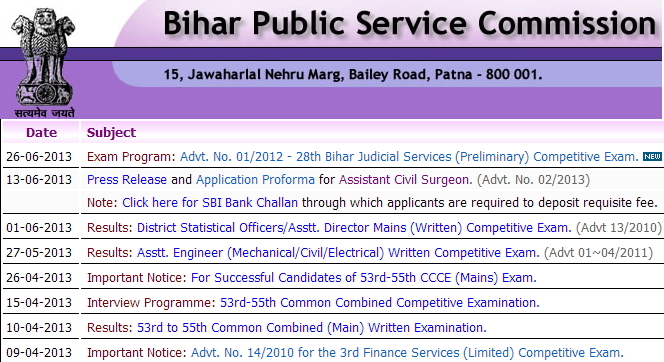 Government Job Vacancies are published in the Bihar Public Service Commission Website where Job Seekers can visit the website http://bpsc.bih.nic.in and click and Read the Latest Job Notification and if the suitable Job Seeker can apply for the Job as per the Instructions in the Notification. Detailed Mark Sheet of Exam already completed will be available in this website. Simply select the Exam and enter the Roll Number and you can see the Marks Obtained in the Exam. mera DOB 25/02/1972 hai.kya mai vigyapan no. (03/2013)ke liye apply kar sakti hu.please reply. mera DOB 04/01/1972 hai and kendra sarkar ke adhin padsthapit hoon. kya mai BPSC 56 to 59 ke liye apply kar sakta hu. please reply.